Tag line: "A laugh tops every thrilling moment!" Take one murder mystery, add a dash of screwball comedy, then top it off with a couple of charming alcoholics and you have 1934’s The Thin Man, a hilarious whodunit that keeps you guessing (and laughing) ‘til the very end. Nick Charles (William Powell), a retired private eye who now spends his days in a constant state of inebriation, is vacationing in New York City with his wealthy wife Nora (Myrna Loy) and their faithful dog Asta when he learns that his old friend Clyde Wynant (Edward Ellis) has gone missing. Soon after, Wynant’s former flame, Julia Wolf (Natalie Moorhead), is found murdered in her apartment, with all the evidence suggesting Wynant himself is the killer. Convinced of her father’s innocence, Dorothy Wynant (Maureen O’Sullivan) asks Nick to come out of retirement and look into the matter. Nick agrees to do so, but the deeper he delves into this mystery, the more suspects he uncovers. William Powell is flawless as the wise-cracking, hard drinking former detective who, even when he’s drunk, is usually the smartest guy in the room. After agreeing to work on the case, he tags along with police detective John Guild (Nat Pendleton) to question Joe Morelli (Edward Brophy), one of the last people to see Julia Wolf alive. During the interrogation, Morelli claims to have evidence proving where he was the night of the murder, and walks into a back room to get it. As Guild waits for Morelli to return, Nick picks up a telephone and puts a call in to police headquarters, requesting they follow Morelli to see where he’s going. At that point, a surprised Guild rushes in to the back room, only to find that Morelli has, indeed, climbed out a window, just as Nick predicted. When not on the case, Nick spends his time hanging around a swanky New York hotel, getting drunk and trading witticisms with his wife Nora, one of the few people who can drink him under the table. Like Powell, Loy is wonderful in the film, and their scenes together are pure gold. Upon meeting Nick at a local bar, Nora asks how many drinks he’s had, to which Nick replies “six martinis”. So, in order to catch up, Nora has the waiter bring her five more martinis, all at once, and line them up in a row! In addition to the laughs, The Thin Man features a nifty murder mystery, culminating in a final sequence where Nick invites all the suspects to a dinner party, knowing full well that one of them is the killer. 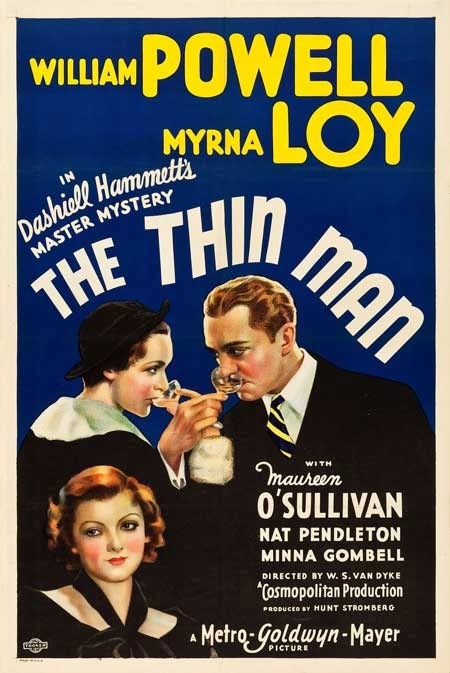 A comedy that doubles as a serious whodunit, The Thin Man is a whole mess of fun crammed into 91 minutes. This is one of my favorite movies from the 1930s. I love the dialogue more than anything. Well, that and the obvious chemistry between Powell and Loy. It looks like they're having so much fun doing this.